The $6.50 Burger (4 oz.) came wrapped in white paper, and it bore a striking resemblance to the bland disaster on a bun that the Apple Pan serves up to duped Angelinos. Surely the citizens of Pasadena would not stand up to those sorts of shenanigans. The Beef: Standard, bland 80:20 Chuck. It was a medium grind, and I let them cook it the way that they liked to cook it. The Preparation: The way they cooked it was a crusty Well-Done, which was fine for a meh-quality beef. The patties were firmly formed and then smashed flat on a searing hot griddle. Even cooked to well, the beef had very little flavor, which indicated that it had been frozen for a good long while prior to making it to the griddle. Ground beef leaks away the flavorful juices and blood during the process of freezing and thawing. Freezing causes ice crystals to form and force their way through the membranes of cells and their organelles. When thawed, the punctured membranes release those liquids. This is exacerbated when the beef is ground prior to freezing, because the mechanical action of grinding weakens those structures in the beef, which causes even more damage during the freeze/thaw cycle. The Seasoning: They thoroughly seasoned the exterior of the patties, but none of that seasoning made it into the blend, very Apple Pan-style, these burgers were dangerously bland. 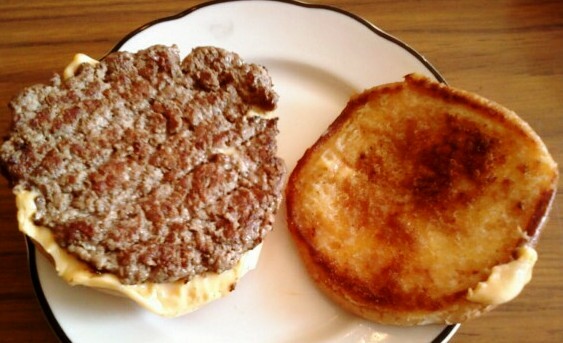 The Sear: They got a crunchy, hearty sear onto the thin patties with that hot griddle. This also rendered out enough of the fat to make these burgers less of a threat to my health. 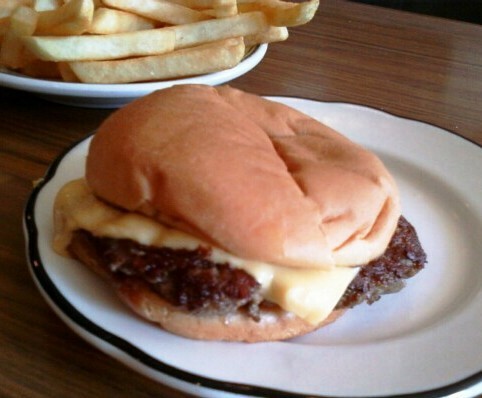 The Cheese: The nicely melted American cheese saved this cheeseburger from failure and abject blandness. The gooey cheese got to work and filled in the crevices of the sear and provided saltiness and umami. As a result, the dish, when contemplated as a whole, rose to the level of OK. Go cheese! The Bun: This was a heavily buttered, moderately toasted, standard, non-seeded, hamburger bun. It was unremarkable and inoffensive in every way. It was a completely neutral bun. The Fries: They were 1/4 inch thick, standard food service fries. The crunch was mediocre, but the insides were creamy since Pie 'n Burger were cooked their fries long but not hot. They were fine. The Value: The value was weak at Pie 'n Burger. If I had been in the market for nostalgia, I suppose the value would have been good, but I really wanted a burger that lived up to the hype or, at least, was better than meh-average. As it was, the burgers were small, low-quality, and over-priced at $6.50 a pop. Ok, ok--the burger was weak to average, but we're talking PIE 'n Burger here, so maybe the pie was the big deal. The pie was NOT the big deal. We tried both the Apple and the Lemon Meringue. Both pies were reminiscent of going to a friend's house when you were a kid. The catch was that you popped by when their grandmother was visiting. Naturally, their parents foisted off some of grandma's pie on you, and it invariably had that old lady taste to it. You dutifully choked it down, because etiquette required that you do so. Afterward, you commiserated with your friend over the grossness of their grandmother's cooking. It was the same deal at Pie 'n Burger--the apple pie's crust was bready, sodden, and overly salty. The lemon filling was disturbingly chunky due to the unblended gelatin or pectin or corn starch or whatever thickening agent was used. The pies were unpleasant and mediocre--oh, and at $3.50 per mercifully small slice, they were overpriced in terms of both portion and quality. Burger Review : Pie 'n Burger--the "mediocre" is silent. Completely agree with this review. 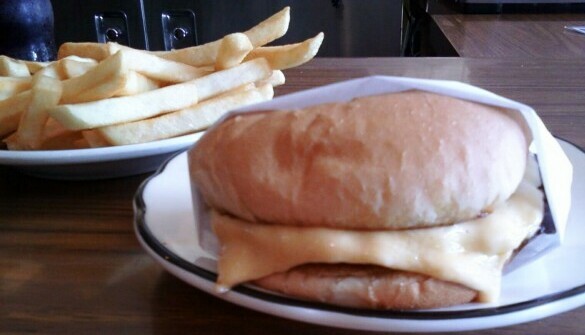 Pie 'n Burger serves as litmus test for me to know if a burger reviewer knows his stuff or not. Yes! Nailed it. Felt like a tiny In-n-Out burger to me. Unremarkable like their pies(cherry, apple). I don't know why they have such a good reputation.